Mobile IT Income tax Software 2018-19 by C. Ramanjaneyulu - IT Caliculation in Mobile Latest IT caliculation Program download. MobileTAX_2019. IT 2018-19 in Mobile. Mobile Income tax Software by Perumal Ramanjineyulu - IT 2018-19 in Mobile : A Mobile Compatible Income tax software for the Financial year 2018-2019 Assessment year 2019-2020 Mobile Income tax Software by Perumal Ramanjineyulu IT Software download. Mobile Income tax Software by Perumal Ramanjineyulu - IT 2018-19 in Mobile. 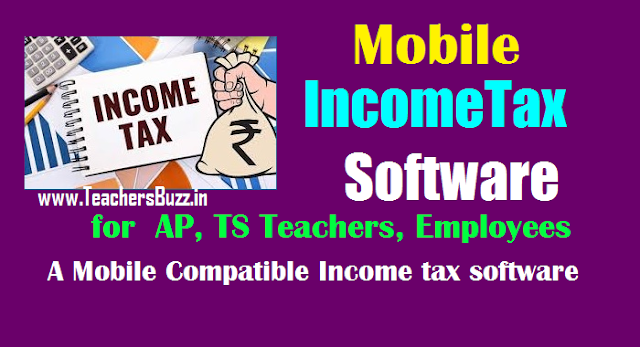 Mobile compatibility IT Software for Income Tax Software FY 2018-19 AY 2019-20 AP and TS Mobile version Employees and Teachers Income Tax Assessment Software 2019-2020 prepared by Perumal Ramanjineyulu available on this page. AP TS Income Tax Software FY 2018-19 AY 2019-20 AP and TS Mobile version Employees and Teachers Income Tax Assessment Software 2019-2020 prepared by Perumal Ramanjineyulu Income Tax Software FY 2018-19 for AP/TS Mobile version Employees Teachers Income Tax Software for Telangana Govt. Employees. Mobile Income tax Software- MobileTAX_2019. MOBILE లో MS EXCEL అనే APPద్వారా మీ INCOMETAX ను మీరు OWN గా PREPARE చేసుకోవచ్చు. COMPUTER లో కూడా MS EXCEL ద్వారా ఉపయోగించుకోవచ్చు.MS EXCEL కాకుండా ఇతర APP లలో... అనగా WPS లేదా GOOGLE SHEETs లలో ఉపయోగించవద్దు. DA ARREARS, Automatic గా DISPLAY చేస్తుంది. Manual Option కూడా ఉంది. BP, DA, HRA,NET... విడివిడిగా నమోదు చెయ్యడం .....ఈ రెండింటికీ అవకాశం ఉండేలా రూపొందించడమైనది. మీ TAX ఎంత అనేది మీరు DATA INPUT అందిస్తున్న SHEET లోనే TOP CORNER లో ఎల్లప్పుడూ DISPLAY అవుతూ ఉంటుంది.